Announcing Edison v1.0 - The Think, Try, Learn Experimenter's Workbook! Why should you try this? I've found that thinking of things this way has been a major help in being courageous, enjoying life, and having more fun. When you get into it, I'm sure you'll discover dozens of current experiments you're running in your life (whether you know it or now), including ways in which you're working to improve yourself - losing weight, eating better, or getting more productive (how about some of your GTD projects, or your productivity practice itself?) Check out How Do You Treat Life As An Experiment? for more. How does it work? It's simple: You create a new experiment for each new thing you're trying , make observations while you're doing it, get helpful comments from other Edison users , then mark it completed when you're done. You can also participate in the community by making comments on others' experiments, such as giving encouragement or sharing your experiences on things you've tried and learned from. To get started, simply click Join, type your name, email, and password, then start entering your experiments. (It's the holidays, so how about watching what you eat or keeping a positive attitude?) Or you can look around at some of the experiments our early adopters are running by browsing the main page or scanning the tag cloud. For ideas, check out the range of experiments in Stories From Edison: Lucid Dreaming, Dropping Twitter, Sleep, And Personal Medical Experiments. A huge thanks to the Think, Try, Learn team: Liza Cunningham (TTL partner, software entrepreneur, and web designer), Andy O'Shea (programmer extraordinaire and Ruby on Rails developer), and Graham Westerlund (web front-end guru, and HTML and CSS wizard). How will you test your idea and measure success? How will you know you are done? How will you enjoy the journey? If you've marked it as public, that is. It’s social networking through thinking, experimentation, and mutual learning. You can see what your friends are really thinking about and doing. It’s should be fun and a great way to see what’s really on the minds of those you know. Thanks, Abe. How's http://ruzuku.com/ coming along? 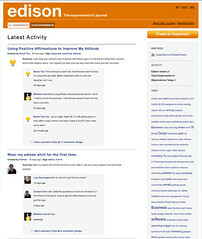 We've run several group challenges (see http://talkingstory.org/2009/11/become-a-better-listener-with-these-5-skills/ for an example), gotten lots of useful feedback, and polished some of the UI. There's a zillion more things we want to do, but we think it provides some utility as it stands. Hey I picked up David Allens' book Getting Things Done! Once again I find myself in the Fed Ex/Kinkos' doing mindless copying when I go to the bookshelf and find a neat book. (I found your website originally after reading Eat the Frog in the Kinko's and then googling it). Anyhow I can see that he's got a lot on the ball when you study the details of what he is saying it make a lot more sense than just reading about the general ideas and saying 'what the heck does that mean??" Anyhow: I really wanted to explain my idea about action folders/action cards. I really never saw the need for action folders, other than the fact that you need folders in your life, I never really graspsed the significance of them, but I did come across a useful idea for me; action cards. The way it works is: usually I have a things to do list. but certain tasks are so time consuming/complicated that putting them in the things to do list just fills up that list and because they dont get crossed off very often it makes it seem that the list is never getting done. So instead of putting it on the things to do list it gets its own card with a list of actions. I guess these are similar to the Next Actions concept of Allens'. To put it simply An action card is really a project and not a thing to do. And so the key is to define "a project" WHich I define as any thing to do that has interrelated steps as opposed to a one step or one off approach. Interrelated steps are those where either: steps must be done in a certain order or finishing one step renders another step moot. So if I put down Go to Bank, Buy Milk, drop off mail. All of these steps have no relation to one another. They can be done in any order and none of the steps depends on the others. Hence they can all go on my To Do list. But say I am working on making a safer at home environment for my dad, I have to call medicare see if they will pay, Get an Rx from Doctor for a life alert, try a do it yourself approach for a remote monitor, etc. Some of these steps have to be done before others while other steps might render other steps moot. If say medicare will pay for electronic monitor I wont have to figure out a do it yourself system. So all of these issues go on an Action Card, labled "dad" or some such. Seems basic, but the trick was to define what is a project and what is a one off. The problem I had with the Allens approach of writing down every single step is a lot of it unecessary. You dot have to write down every single step to get to the supermarket. Do you have to write down: "pick up milk from display" Do you have to write down "Write down 'pick up milk..'" ? There is no end to this and there is no def'n for when you need to write down action steps and when you just do it.